I’m very excited to announce that we are in the final testing stages of ReactionGrid’s 0.7.2 Opensim update. And to celebrate, we’ll be having a SPECIAL Hypergrid Adventurers Club meeting tomorrow! WHEN: Tomorrow, Wednesday, Sept 28 @ 10am Eastern Time (EDT). That’s 14:00 GMT/UTC. WHERE: The region HGBridge on ReactionGrid’s 0.7.2 Alpha Test Grid. HOW: You can create an account on the Test Grid and log in by following the instructions on our blog. After we all gather on the region HGBridge, we’ll try jumping to GermanGrid, NewWorldGrid and perhaps a few other places compatible with 0.7.2. 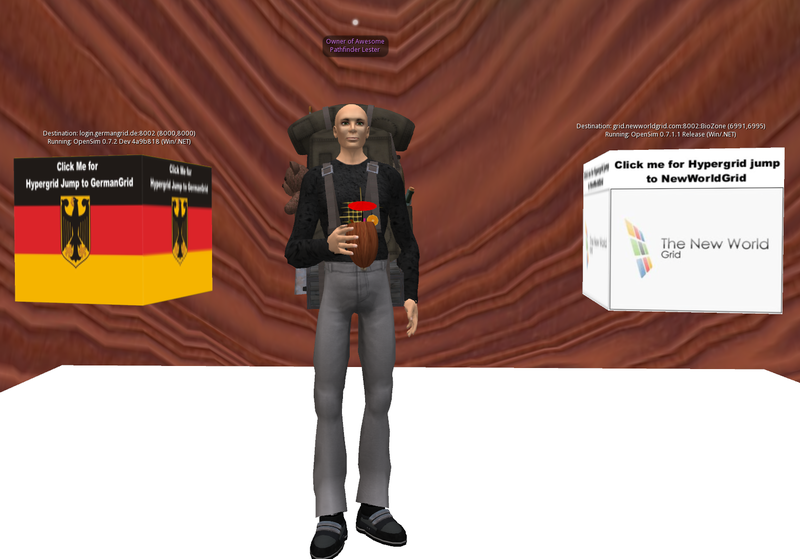 This entry was posted in Announcements, Avatars, Education, Hypergrid Adventurers Club, Virtual Worlds and tagged avatars, education, HyperGate, HyperGrid, Hypergrid Adventurers Club, metaverse, online communities, OpenSim, ReactionGrid, virtual worlds by John "Pathfinder" Lester. Bookmark the permalink.